This delicious salad is ready between 5 and 10 minutes! Just mix the ingredients described below, a child can do the laundry (Dutch saying means: It’s too damn easy!). This great recipe comes from Zinaida, a good friend of mine. She even got her little daughter of 4 enjoying vegatables by serving this salad. The slightly salty flavour of Parma ham and sweet dates gives the perfect flavor. Suggestion: If you don’t eat or like pork, switch the Parma ham with beef carpaccio to keep the mixture of salt and sweet. 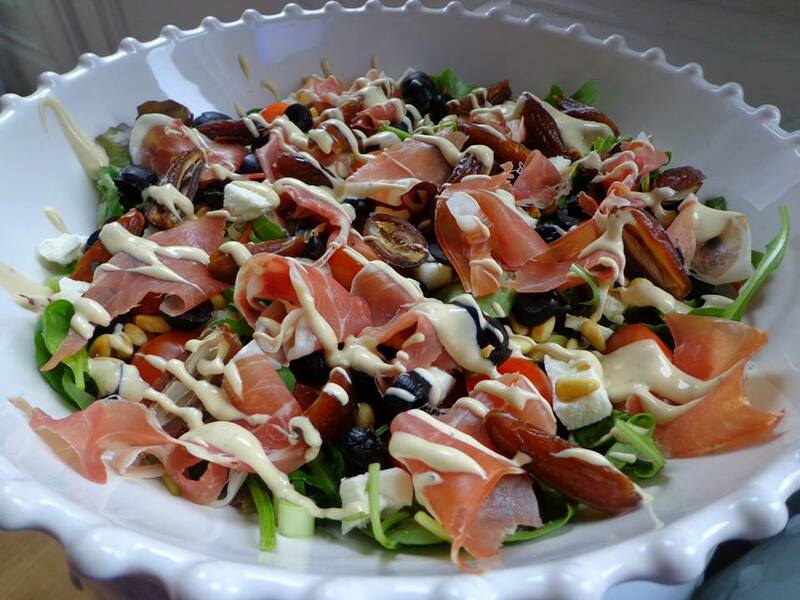 Garnish a big bowl with the lettuce and spinach, sliced cherry tomatoes, Parma ham and black olives. Deseed the dates and chop them into half. Slice the goat cheese in small pieces. Roast the pine nuts and arrange everything in the bowl. Pour over the dressing and serve. Enjoy!